Network Automation is new hot area in the config management world. When studying network automation, it become clear that deciding on a data model was important. The good people of OpenConfig have spent some time developing a data model that can applied to different switch and router vendors. OpenConfig defines its networking data model using YANG. Unfortunately Ansible cannot use this as a data model language so it needs to be converted to YAML. 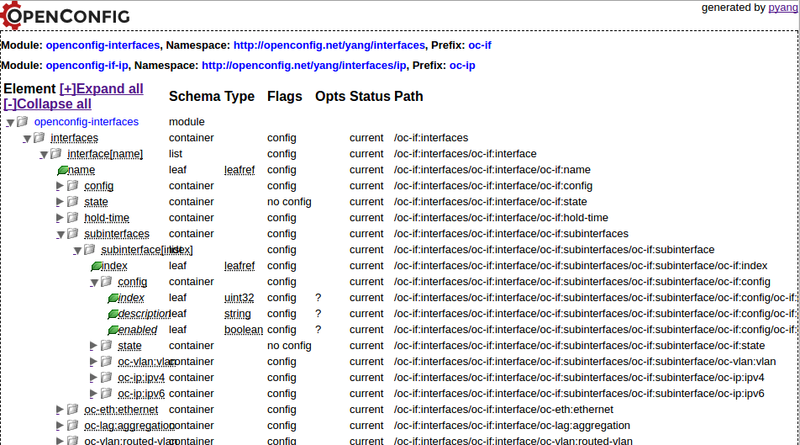 Let's take a look at how to convert OpenConfig YANG files into navigationable Web pages (jstree) and YAML. Run Pyang on files that end with "uses ...."
If you try to run pyang on a file that ends with uses .... like uses bgp-top, then Pyang does print anything. This produces a datamodel in a tree structure. But if you run pyang -p release/models -f tree release/models/ospf/openconfig-ospfv2.yang you get no output. The ospfv2.yang file does not have a uses ... at the end of it. The openconfig-bgp.yang does and is shown below. It prints out a tree with only basic interface related info. This info does not include any IP address structures in the data model. If you want to include ip addressing in the data model output then use what is called a YANG augment. Augment files are added at the end of the main YANG file.